Scrolls of acanthus leaves decorate this royal court inspired pattern. It is easy to imagine a Contessa, an Italian Countess, in a gown covered with this design. 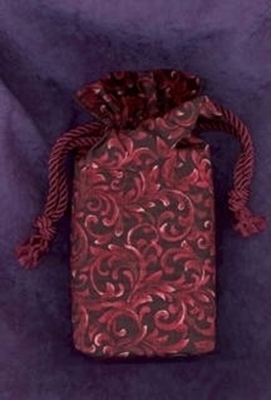 The background is black and the vine scrolls are various shades of red ranging from crimson to burgundy. Many tarot decks have ornate scrolled borders or scrolled details on the clothing worn by the characters on the cards. This is a bag that will likely coordinate with almost any Old World style deck.